I'm very much of two minds on this one. All the plant-seller websites tell me that it's a super-easy plant; my actual experience with it has been decidedly mixed; and lots and lots of other people have had a really tough time with it. If you do a web search for Homalomena1 'Emerald Gem,' you will inevitably run into sites that praise the hell out of this plant. You'll read things like, Compact shape! Tolerates low light! Disease resistant! Tolerant of stress conditions! The perfect choice for an area with height restrictions! Humidity is not critical! Easy-care! Remains lush and healthy! Durable foliage!2 In fact, the word "durable" and variations on "durable" are repeated in almost every profile. This raises some questions. Like, what does it mean for a houseplant to be "durable?" Exactly what sorts of conditions can it survive because of its durability? If it's so durable, why are all its leaves turning yellow? Nobody ever says. For my own plant, this was never really that big of an issue, because I got it cheap ($3) and only got it because . . . well, because it was cheap, and because I wondered if it would work for me.3 So, you know, durable or not, who cares. That was about eight months ago, and although it doesn't look as good now as it does in the above picture (which is from October), it's still alive, and it gets by okay. The number one problem actual people will report to you about this plant is that it drops its lower leaves. A lot. I'll be blunt: I do not know why this happens. I would normally assume that it's from overwatering, and watering is probably a factor in there somewhere, but my plant doesn't drop leaves with any kind of predictable pattern at all. I have no idea what it wants me to be doing differently. The two concessions to reality that (some of) the plant sellers make are, they tell you 1) don't leave the plant to stand in water, and 2) don't let it get cold. There's wide disagreement about exactly how cold is too cold, but I've seen warnings about 70ºF (21ºC), so be aware that we may be talking about a plant with a pretty extreme understanding of the word cold. My problem might be temperature: the plant is a reasonable distance away from any doors or windows, but it's probably not so far away that it never dips below 70ºF. We had an opportunity to get some of these in, on the last tropical plant order we placed. WCW4 nixed the idea, on the grounds that Homalomenas5 have not been easy to maintain in the greenhouse in the past. This is easily explainable, though, if we accept that they might start throwing leaves at 69ºF: certain areas of the greenhouse are at or below that temperature all the time in the winter. When customers ask for recommendations for dark spots, I run through the standard list pretty quickly6, and more often than not people don't like any of them. So more options are always nice, and Homalomena would fit the bill if I could recommend it with a clean conscience. As it is, though, it's too difficult to recommend to most people, we can't keep it in the greenhouse anyway, and if neither of those were a problem, there's still the issue of it not really looking that exciting. The leaves are nice, true: they're shiny, they're green, they have an interesting texture, and the plant is self-heading, but all of that also applies to Spathiphyllum spp. or Zamioculcas zamiifolia, which are also much easier plants, and the first even has attractive flowers into the bargain. Light: flexible. I wouldn't put one in partial sun, but filtered or reflected sun should be okay. And, actually, my plant was doing pretty well during the summer when it was getting about an hour of direct sun every day. Humidity: Nice if you can get it, but seems not to be critical. Pests: I assume it's probably subject to the same ones as any other plant. I've yet to have any pest problems with mine, and pest / disease resistance is supposed to be a selling point, but considering how hard the plant sellers are hyping the plant, I'm thinking the pest resistance may be overstated too. Grooming: One does get tired of picking off yellow leaves, though it's not like you're doing it constantly. Fertilizer: I've fed mine once or twice, but really don't know what it needs exactly. My growers' guide says they're pretty heavy feeders, though not insatiable, and they're also sensitive about high levels of soluble salts in the soil, so it's potentially a bit of a catch-22. Propagation: I assume that plants like my own, which have multiple plants potted up together, can be divided fairly safely, but beyond that, I have no idea. The growers' guide says they're mostly from tissue culture. The hype isn't the plant's fault, obviously, but even so, somebody is being a little dishonest. They're not all that easy to grow, and it's a little cruel of the tropical foliage industry to suggest otherwise. I understand that business is business, and people are in it to make money, and it's hard to make money if nobody buys your plants, but it seems to me like there's not much money in convincing people that they have black thumbs, too: people who think they have black thumbs don't buy very many plants. Either give better instructions, or acknowledge that it's maybe not the easiest plant, you know? EDITED 5/13/08: It actually got worse, so I raised the difficulty level from 5.5 to 6.7. We seem to be arguing mostly about how much water it deserves, but it's also not bouncing back since I started trying harder. I'm afraid its days are numbered. EDITED 1/20/10: Not sure what changed, exactly, but it's behaving itself just fine now, so I moved it down to a 3.8, which is approximately "normal" difficulty. The location it's in at the moment has a bright fluorescent light about 2-3 feet above the rim of the pot, it's warm all the time (because it's near the ceiling, in the kitchen / living room), and I water it when it begins to droop a little. The drooping is pretty subtle, unfortunately. I'm also feeding it, and I wasn't before, though I'm not giving it a lot of food. This all seems to be working out just fine, so possibly it was over-potted before and has only now grown into its pot, or it really does begin to throw leaves at 70F/21C and is only happy now because it's never that cold, or it's not the low-light plant it's advertised as being. Something doesn't add up about all this, but it's working now, so I'm not going to complain. Photo credit: both my own. 1 This is actually pronounced "Hahm-uh-low-MEE-nuh," but I always pronounce it "HAHM-uh-LAW-muh-nuh," for reasons which will be explained shortly. The ultimate expression of this association is that now my husband or I will automatically sing "doo doo de doo doo" in response to the other of us saying "Homalomena," which I hope we never have to explain to anybody we don't know. 4 = Wonderful Co-Worker, the other person working in the greenhouse right now, who has been mentioned repeatedly in the blog already. 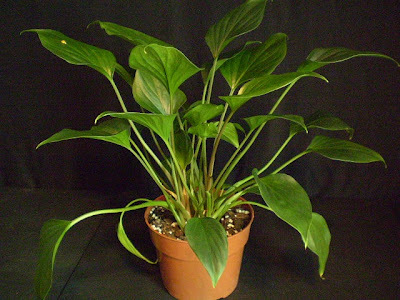 6 Dracaena fragrans, Dracaena deremensis cvv., Aspidistra lurida or A. elatior, Spathiphyllum spp., Sansevieria trifasciata, Zamioculcas zamiifolia, Aglaonema spp., Philodendron hederaceum, Epipremnum aureum, and Chamaedorea elegans, more or less. Sometimes also Rhapis excelsa, Chlorophytum comosum, and Chlorophytum x 'Fire Flash,' depending on how low they seem to mean by "low." 7 Particularly not if you kill the plant. 8 The dry side of what? I inherited a client who had one of these - I didn't know what it was for a year or so, and neither did my coworkers. At first we thought either an anthurium or a philodendron. 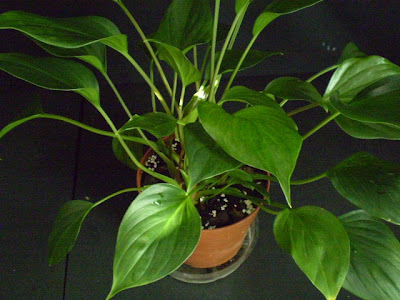 Based on my experience with a grand total of one, kept in fairly bright light and a room that's never cold, it seems to like the same treatment that you would give an agloanema or a philodendron. Mine went through a period of yellow leaves, which I think had to do with a prolonged dry spell followed by a little too much water. I just watched the video and laughed the whole way though----those monsters were pretty cute!!! I've had one for 5 or 6 years, and have had similar experiences. If a leaf droops from the soil getting too dried out, it's almost guaranteed to turn yellow soon after. During the recent East Coast snow storm, it spent 3 or 4 days below 40 (no power) -- TWO of the twenty or so leaves survived unscathed. Meanwhile, the Croton Petra, Anthurium, and even the orchid (Phalaenopsis) seem to have fared better. Warmth and damp soil are a must. You are SO helpful! Googling brought up your site when I asked: Help for Homalomena. Thank you! I had a gorgeous one; lost to drooping leaves which turned yellow in a few days & was gone. Bought two more last week..one in lr drooped. I found some water in pot and immediately drained it and hoped for the best. Second one in dining room, still beautiful & perky. Now I bet anything I know the reason for the lr one drooping...cold. I would NEVER have thought of that. Closing the sliding door asap. Thanks so much for telling it "like it is" with these lovely Emerald Gems! hanks very much for posting this. I've just found your website and I LOVE it! I hate figuring out how to take care of my plants by trial and error, and seeing someone elses opinion is nice. Seconding Arielle's mealy bug problem - my three-month-old has had a persistent case, and I'm about a month or two away from giving up on it. The bugs clearly came from the nursery I bought it from, but they are just not going away - insecticidal soap, neem oil, hand-smooshing, what have you. Also did the worst of all my established plants at being left watered that day then drought during a two-week vacation (though some tropical seedlings full-out died, but they obviously weren't established, so...). This is probably too old of a post to comment on, but i have had mine for about 4 years now and it has always been very easy to take care of. It did go through that constantly dropping leaves thing after about a year and a half, it was almost bald..thats when i decided to replant it in a larger pot, since i replanted it it hasnt dropped but one or 2 leaves! It has spread out more and seems to be very happy and strong with new leaves growing everyday! I also dont agree with the low light statement, mine is on a plant stand in a south facing window all day everyday and LOVES it! I have two of these, the second propagated from the first, with a new prop in the wind very soon. Been growing for 6 years now, in very large pots (swimming pool sand filter cases) and get a minimum of watering, plus a 6-monthly dose of blood&bone fertilizer. I prune dead leaves regularly, returning them to the soil in the pot as mulch/compost. I do fairly well with plants of various types I cannot type though). My Homolumena plant has been wonderful... I live in Northern California, East Bay Area, inland. Our temperatures range from 30's to tripple digits like yesterday was 106F.. Indoors the temperature has been as low as 64F degrees. I have it living indoors. On a plant stand with other plants. I water it once a week and the soil tends to be dry at that time .. It is pot bound 4" pot ( I swear I keep saying I will transplant it) I have 4 flower buds on it though they have not opened but are increasing in size. Light Low, maybe first sun in the morning for about 1 hour after sunrise. It is in an east facing window with the over hang of my deck blocking any more exposure to direct sunlight. We call it filtered light Thow the window glass is clear. Occasionally it will yellow out the lowest leaf, and I mean occasionally. Please try to water it when it is dry enough to pull away from the sides of the pot. or once a week what ever is sooner. Once in a while if it looks droopy I will water with plain tap water no fertalizer to wet the soil, which has very good drainage, and still water and feed on my regular weekly schedule. I also found this in a supermarket for three dollars lol.There was a more expensive one but this we the runt of the plants so naturally I got that one. It is a wonderful , beautiful plant and I have had no problems with it in any way since I bought it over 2 years ago more like 3!/2. Hello. My name is Cindy. This plant seems to do well in low light and let it dry out between waterings.I live in Alaska and work in a greenhouse. I've been keeping it on the cool side in there and it doesn't seem to mind. We also have circulation fans to keep the air moving.The big plant has a couple of buds on it. So, time will tell. I just bought a huge one at home depot because it was cheap and it was beautiful. The bottom leaves are turning yellow big time. My house is 70 degrees no drafts. I water it with a glass globe. It takes water as it needs. I'm afraid I'm going to kill it. Help! How long ago is "just bought?" It's not unusual for plants to take a while to adjust to a new environment, and to drop a few leaves during the process. I keep trying these, and keep losing them. You'd think I'd learn. But I'm a sucker for their gorgeous heart-shaped foliage - like a bouquet of hearts, when they look good. Can't ever get the pot type or the watering right. Too much, too little, they don't like it. Leaf tips burn, then whole leaves get yellow. And they never get bigger. They don't thrive, just survive. But I've decided to treat them as an "annual" of sorts, and toss and replace them when they get ratty-looking. They will look nice for a while after you buy them, so if that's worth it to you, go for it.